Last week we got the chance to have a chat with our favourite plant-based chefs, The Happy Pear. If you’re a fan of vegan, vegetarian and plant-based food and haven’t heard of the Happy Pear, you’re missing out majorly. The Irish twins Steve and Dave Flynn have been on a mission to make the world a healthier place since 2004. Over the past 14 years, they have opened three cafés and food stores in Dublin and Wicklow, produced their own range of healthy food products now stocked across the globe, launched a YouTube channel, created three veggie cookbooks and much more. It's worth mentioning that not every recipe is 100% vegan, but most are easily veganised. We’ve been fans of The Happy Pear ever since Sean borrowed their first cookbook from a colleague a few years back. It made vegan cooking fun, exciting and easy. Their cafe-restaurant in Wicklow is the perfect spot to stop for lunch after doing the amazing walk from Bray to Greystones Cliff Walk – an absolute must-do activity if you’re ever in the area. So, when we heard they were going to be in our neck-of-the-woods promoting their new cookbook and healthy meal range, we were there. The guys did a cooking demo of four quick vegan recipes which we’ll definitely be trying. We were blown away with the unbelievable simple and elegant two ingredient chocolate mousse. Steve and Dave gave a bit of a background on how they’ve become Ireland’s poster boys for healthy eating. To our surprise, the twins started out as pretty typical meat-eating, rugby playing, beer drinking lads. It was only when they both left Ireland, that things took a change. While in Canada, Steve was introduced to vegetarian food for the first time. His mind blown by lentils, he quickly became vegetarian. He said he had never heard of a male vegetarian before then, it just wasn’t the done thing. Not to be outdone by his brother, Dave who was in South Africa at the time followed in Steve's footsteps. Their competitiveness resulted in both becoming vegan shortly after. They returned to Ireland enlightened and ready to start a food revolution. They opened their first fruit and veg shop in Wicklow and a couple of years later they opened the first Happy Pear café restaurant and the rest is pretty much history. They are huge practitioners of self-care and wellness. Even in the depths of winter, Steve and Dave swim in the sea most mornings. They also practice mindfulness through daily meditation and keep fit with regular cardio, yoga and even handstand training. At the event, they gave some tips for a healthy, happy life, focusing on the statistics of the Blue Zones – the places in the world with the most centenarians. These locations are not close geographically, but their inhabitants share some key commonalities; following a mostly plant-based diet, making time for the ones you love, moving your body and living with purpose were among the main points. The brothers contribute their boundless energy and lust for life by living as close to the Blue Zones as possible. 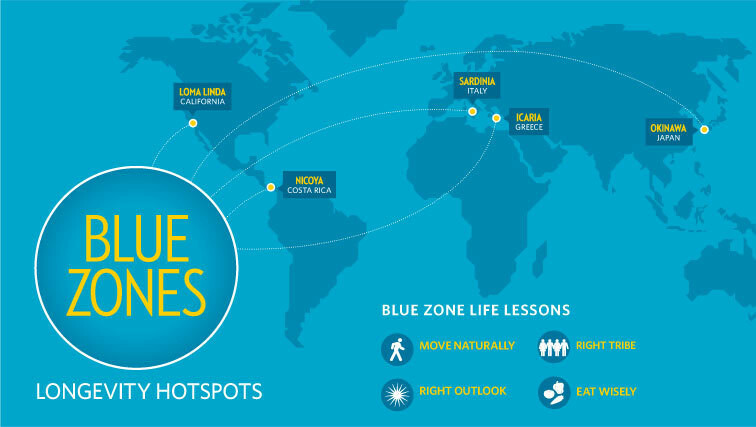 You can learn more about the Blue Zones here. They also talked about the importance of surrounding yourself with the right people. Positive people breed positive energy and that’s infectious. When they returned from their travels they found that their friendships had changed. Steve and Dave were extremely gracious and we managed to have a quick chat with the guys after the demo – they were absolute legends and gave us some words of wisdom. Excuse the blurry photo - it was very late in the evening just before the lads headed back home. Most importantly, we managed to pick up the latest cookbook which has already become a staple in our kitchen. You can pick your copy of the new cookbook Recipes for Happiness now.